Nature Communications has published a lengthy study on li-ion battery volatility including a fascinating look inside an exploding battery. Recently, several reports have emerged of Li-Ion battery related issues on board planes and growing concern among airlines. Lenovo has issued a recall for thousands of Thinkpad batteries due to fire risk. 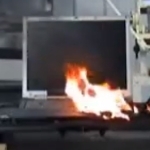 7 years ago, PC Pitstop helped expose the dangers of Li-Ion batteries. News that Best Buy has been forced to recall more batteries — suggests nothing has changed.